There's something just so blissful about weekends, isn't there? Sometimes it's staying up and out as late as you'd like on a Friday night, knowing you can sleep in the following morning. Other times, it's the excitement over plans you've made with friends and loved ones -- excursions that feel like a lifetime away on Monday but become so deliciously tangible by the time Thursday rolls around. And every now and then, it's not having any plans at all -- just having the freedom to relax and do whatever you feel like without an agenda. Well, lucky me! The beauty of being imaginary is that every day feels like a weekend day. I know not everyone has this luxury, so that's all the more reason to celebrate those Saturdays and Sundays when they make their appearance. Heather knows this, and she made sure that her friends did too when she brought a round of margarita cupcakes to a friend's birthday party. Tequila-spiked butter cupcakes filled with zesty (literally!) 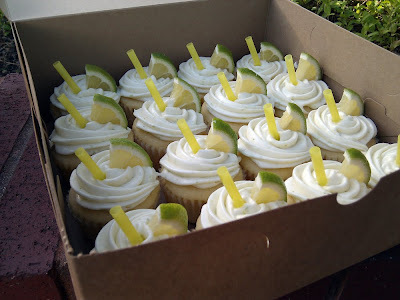 lime custard, brushed with tequila, and topped with lime cream cheese frosting and a fresh lime wedge. Add a sprinkle of course sea salt, and you've got a cupcake that tastes true to its cocktail namesake, a cute little party favor, and a nice way to wish a friend a very happy birthday. 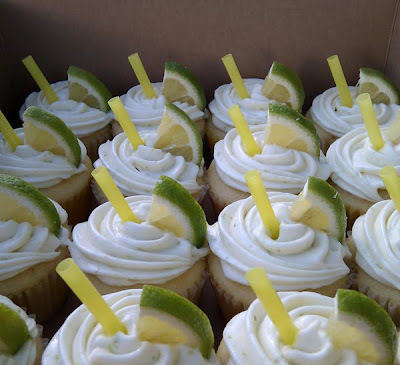 Thanks, Heather -- I hope these cupcakes brought some extra sweetness to your weekend!